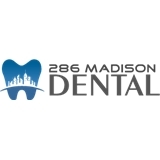 286 Madison Dental (New York) - Book Appointment Online! I'm one of those people that had bad experiences with the dentist as a kid and put off needed dental work. Dr, Kimon put my mind at ease and made me feel comfortable. Several visits later all the necessary dental work is complete (and no pain!). I highly recommend Dr Kimon - he took the fear out of going to the dentist. State of the art practice with high quality modern technology. Front staff was very welcoming and informative. Both Dr. Shmuely and Dr. Kaufman (periodontist) have more than enough experience in patient care but still manages to make me feel relevant as a patient. I highly recommend them if you are looking for a dentist who actually cares about your health personally and doesn't try to upsell you unecessary treatments. My doctor for life. Must see! My first visit with Dr. Kaufman was amazing and I would recommend him to anyone. The office had a hard time finding my insurance information, but they were very courteous. Dr. Hausserman was very nice. The office runs pretty efficiently, but the Dr. did step away to see another patient during my cleaning.